In the spirit of Michelle Kholos Brooks’ play, Hitler’s Tasters, which shifts the focus of a male-dominated war narrative to the women, New Light Theater Project is proud to present three new female-driven events. 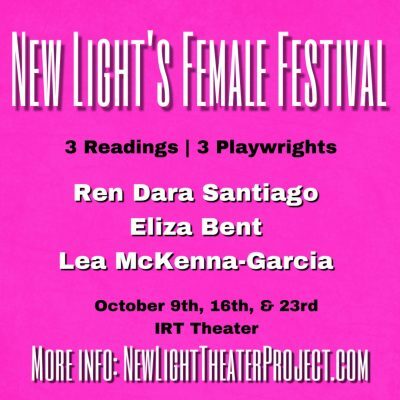 With new works by playwrights Eliza Bent, Ren Dara Santiago, and Lea McKenna-Garcia, and direction by Sarah Hughes, Jenna Worsham, and Rebecca Cunningham, this festival aims to interrogate an historically masculine America by providing a new lens through which to view it. The lives of two Filipinas and a boy from Harlem overlap in present-day Manila. One wants reunion, one wants revenge, one wants revolution. The liars are exactly who you think they are. The honest are never what you’d expect. In a country run by the “Trump of the East,” it’s hard to know which side of justice you really stand on. Ren Dara Santiago (Playwright) is a Fila-Rican playwright from Harlem. Eve Angel was written in 2018 with the support found in Gingold Theatrical Groups’ The Speaker’s Corner, Clubbed Thumb’s Early-Career Writer’s Group; paired with mentor-playwright Erin Courtney and the Playwriting Mentorship Residency at SPACE on Ryder Farm mentored by Adam Bock. The Siblings Play has had development at The Cherry Lane Theatre (Mentor Project), Labyrinth Theater, MCC Theater, Ojai Playwrights Conference, and Rattlestick Playwrights Theater. She is a guest teaching artist at The National Theater Institute at the Eugene O’Neill Theater Center. Ren is a former Artistic Producer and founding member of Middle Voice at Rattlestick and an eternal member of The Baldwin Project by Lucy Thurber, who has mentored her since adolescence. Set in 2002 in a magic shop in Boston’s Faneuil Hall, Eliza Bent’s new play THE REGULARS examines the stories we tell ourselves (and the more complicated realities) about what it has meant to be an “average American” throughout our nation’s history, from its founding through today. Eliza Bent (Playwright) is a playwright and performer based in Brooklyn, NY. Bent’s plays have been developed and presented in productions, readings, and workshops at Clubbed Thumb, the Abrons Arts Center, JACK, the Atlantic, and the Bushwick Starr. Residencies: Berkeley Rep’s Ground Floor, SPACE on Ryder Farm, New Georges Audrey Residency, Target Margin Institute Fellow, MacDowell Colony Fellow, currently artist-in-residence at the Abingdon Theatre. Awards/Citations: LMCC procress grant, Critics Pick for Toilet Fire, 2014 Payne Award for Outstanding Theatrical Event. Bent is a former senior editor at American Theatre magazine, a frequent guest artist at the Great Plains Theatre Conference, and an adjunct lecturer in creative writing at Brooklyn College where she received an MFA in playwriting. Her next play BONNIE’S LAST FLIGHT will premiere in February as part of New York Theatre Workshop’s Next Door Series directed by Annie Tippe. Sarah Hughes (Director) is a director and producer of theater and new media. Her work embraces limitation, values accidental discoveries, and is deeply collaborative. She uses humor, physicality, and unexpected choices in casting, staging, language and tone to create medium-specific, inclusive, shared experiences that aim at truth rather than at the effect of reality. Sarah has developed new plays, performance art pieces, devised works, and immersive installations with Eliza Bent, Julia May Jonas / Nellie Tinder, MJ Kaufman, Sibyl Kempson, McFeely Sam Goodman / Limited Liability Theater Company, Chana Porter, Deepali Gupta, Corinne Donly, Cara Scarmack, Alaina Ferris, Paul Cameron Hardy, Pablo Helguera, Will Davis, MoMA, the Office for Creative Research, Vox Theater, Half Straddle, and Superhero Clubhouse. With Graham Sack, Geoff Sobelle and Sensoriumshe has created Virtual Reality pieces for Tribeca Film Festival, New York Theatre Workshop, The New York Times, and Penguin Random House. Sarah’s work has been seen at Abrons Arts Center, BAM Next Wave, The Bushwick Starr, JACK, Japan Society, The Tank, Caveat, The Brick, The Segal Center, PEN World Voices, Columbia University, Signature Theater, The Flea, Prelude, and CATCH, among others. Sarah worked with Elevator Repair Service from 2007-14, assistant directing Gatz, The Select, Arguendo, Shuffle, and Fondly, Collette Richland off-Broadway and on tour, and was Co-Artistic Producer of Target Margin Theater from 2015-17. She co-teaches a class on Contemporary Theater at Dartmouth College and is a New Georges Affiliated Artist, a Target Margin Associated Artist, and a 2016-17 Civilians R&D Lab member, a Clubbed Thumb 2017-18 Directing Fellow, a 2018 New Georges Audrey Resident, and a member of the 2018-2020 WP Theater Directors Lab. Regina’s a modern girl with modern problems. Her boyfriend wants to open their relationship, just as she’s embarking on a project to adapt Lady Chatterley’s Lover for the #MeToo generation. How can one woman find herself while adapting a book with a pornographic reputation for this brand new Old World, without losing her feminist values in the process? A contemporary response to one of the most salcious (and banned) books of the twentieth century.